The front page of this morning's Chicago SunTimes brought more bad news for inner-city Chicago. A drive-by shooting killed a 9-year old while wounding three others. Read the SunTimes story here. 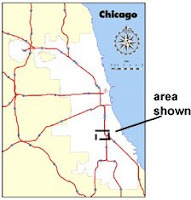 This map shows that the shooting took place in the South part of Chicago, just West of the major expressway bringing people from the suburbs to the LOOP to work every day, and bringing people traveling from Eastern states to Western states straight through drive-by poverty. 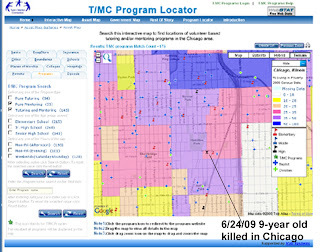 Using the interactive Tutor/Mentor Program Locator, I created this map view showing the area where this killing took place. My goal was to understand the impact of poverty, and the availability of youth programs that might be working to give kids different opportunities, and reasons not to become part of this culture of violence. 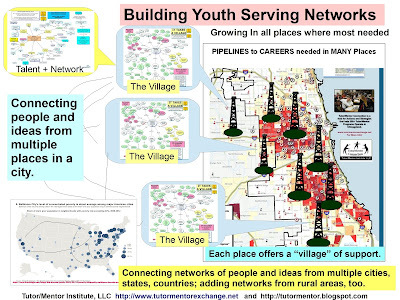 My map shows no volunteer-based tutor/mentor programs within this area. Using the features of the interactive map I was able to search to see what faith groups might have locations in this area, and what banks, or insurance companies. While the expressway, and Vincennes Avenue bring people through the neighborhood, some one needs to try to get some of those people to stop once a week, or provide financial support, to help a community group form that might build a range of non-school tutoring, mentoring, arts and technology programs in this area. That won't be easy. It's not a quick fix. But the volunteers President Obama is mobilizing could form planning teams, using the information on the T/MC web site, who would lay the foundation for further growth during the 2009-10 school year. Perhaps by January 2010 there might be a core group of volunteers, parents, community leaders and donors willing to make a life-changing commitment to the kids in this area. 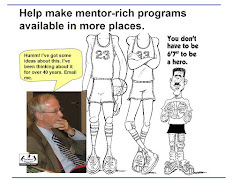 If you want to know how to add a new program to the Tutor/Mentor Program Locator, call email tutormentor 2 at earthlink dot net and ask for help. If you want something like this in your own city, call the same number.